New iPhone, NY Now and Death of Pillsbury Dough Boy (Again) - 10 Minutes of Brilliance: Smart, Funny, Creative and FREE! Hi, welcome back to 10 Minutes of Brilliance. I am very happy that… Hey, wait a second! Something’s different.! Somebody’s changed my blog! HARRIET: Do you like it? I did a little Spring Cleaning. Spring cleaning? It’s almost fall. STAN: Chill, Jack. Harriet was just using a figure of speech. You should know that. You’re a writer. I know I’m a writer, Stan. I write everything you say. I do, too. Oh, why argue with you? You’re so stubborn. STAN SMILES AT ME KNOWING HE WAS JUST BEING STUBBORN WHEN HE SAID HE WASN’T STUBBORN. What I don’t know is why you messed with my blog, Harriet? HARRIET: I didn’t mess with it, Jack. I cleaned it up. Gave it some order. Before, everything was all over the place. And so were you. You’d start with one subject, then wander into another. It was like you had Attention Deficit Disorder and your stream of consciousness wouldn’t shut up. STAN: You mean your strategy was to be disjointed and hard to follow. No! Look, stay out of this Stan. I don’t need to be told what to do by an imaginary character I created. HARRIET: Yeah, Stan. I can fight my own battles. Look, Jack, let’s try it this way just once. But there are only 5 subjects. HARRIET: Six, really, I dusted off the Pillsbury Dough Boy obituary from 2010 and put it at the end. All right, I’ll give it a try. But I don’t like it. STAN: I agree, Goldberg. I’ve never liked any of your blogs anyway. HARRIET: Yeah Stan, close your yapper. Now. without further delay, here’s the New Improved Version of 10 Minutes of Brilliance! 3. 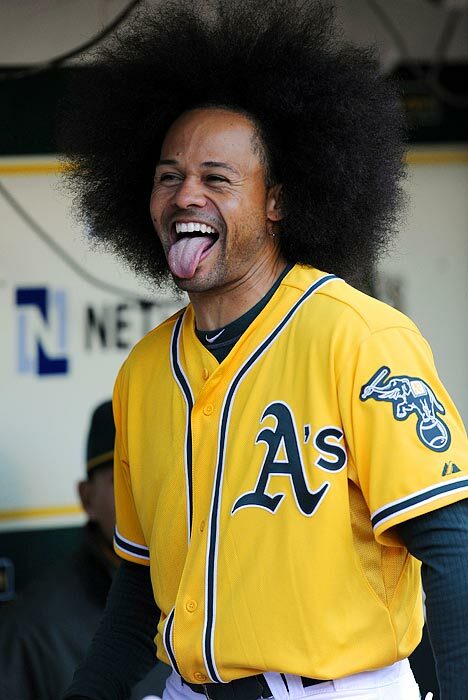 SPORTS NEWS: Coco Crisp, Part of a Balanced Breakfast! STAN: You digress? Your digressions digress. Nothing new here. Move along folks. There’s nothing for you to see. Where was I? Feeding the animals? No, hat’s not right. Oh, yeah. I was telling you about Apple’s Big News. Two of our best 10 Minutes of Brilliance Reporters have gone to great lengths to uncover the truth about the new iPhone 5s. STAN: Yeah, they read last Friday’s Wall Street Journal. The new iPhone 5S will have a processor almost 35% faster than the most recent iPhone. The camera will be much improved and it will have a longer-lasting battery life. It will reportedly have a fingerprint sensor so only you (or someone with your fingerprints) will be able to use it. 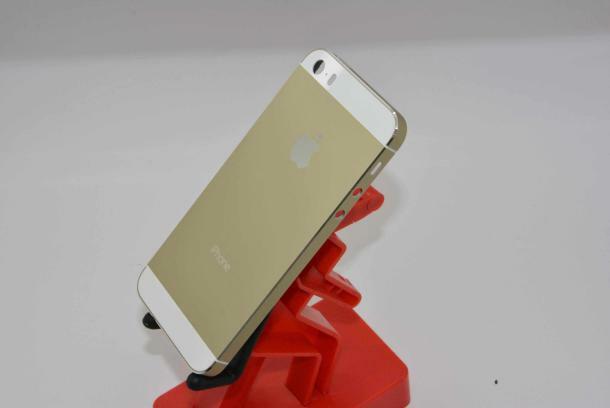 There’s a great deal of excitement and speculation about the inner workings of the iPhone 5S, which will run on the new iOS 7 operating system. For the first time, the iPhone will sport colors other than black or white. One is gold colored. Apple wanted to call the new color Champagne (and they still may), but the French organization that protects the use of the term “Champagne,” has threatened to protest Apple’s use of their valuable intellectual property. STAN: Intellectual property? 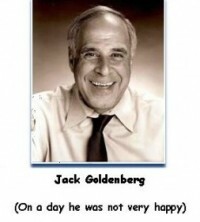 What does Goldberg mean, intellectual property? HARRIET: Don’t worry. You don’t have any. You can’t blame the French for wanting to protect the name “Champaign.” They don’t want to be liable if someone drinks the new iPhone. A second color is reported to be graphite . Apple will also release another new iPhone, the 5C, a budget friendly version for those who want to stick their toe into the water. On Friday, August 30, Apple announced a massive trade-in program to grab market share and preempt smartphone users from deciding to purchase mobile telecommunications devices (a. k. a. cell phones) from competing smartphone manufacturers. Apple’s new retail trade-in program, dubbed ” iPhone Reuse and Recycling Program,” has only three qualifications. The iPhone you trade in has to work (it must turn on), you must purchase a new iPhone before leaving the store, and you have to have a current contract with a wireless carrier. Apple will pay you up to $280 (in credit for a new iPhone) and the prices they will pay will fluctuate. Trade-in values may go up or down in the future depending on supply and demand. The 16GB iPhone 5 in good condition will have a trade-in value of about $250-253, a GSM 8GB iPhone 4 will bring $120-140 and the CDMA version will be worth about $80. But these trade-in values are significantly lower than current trade-in quotes being offered by competing services like Gazelle and NextWorth. Additionally, we’d advise you to see how well you can do by offering your old iPhone for sale on ebay or Craigs List. Since the new iPhone 5S won’t be available until sometime between September 10-20, customers who want to trade in their old iPhone will have to settle for a gift card that can be used to purchase the 5S once “the latest and greatest” arrives inthe store. The National Hurricane Center started naming hurricanes after females in 1953. In 1979, men got equal rights and storms were named after them. And it wasn’t long ago that Global Warming was renamed Climate Change because so many Right-Minded Conservatives sullied the previous moniker. Certainly we’ve had hurricanes, tornadoes and tsunamis before we wrecked, I mean, roamed the planet. But evidence has shown the violent weather we’ve been having may be related to what we’ve done to Planet Earth. That’s why this wonderful video makes so much sense. Let’s start naming hurricanes, storms and other natural disasters after people who’ve been denying climate change exists. The video is terrific. Enjoy. Sports News: CoCo Crisp, Part of a Balanced Breakfast! 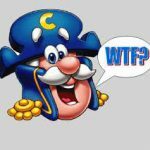 Coco Crisp, an outfielder for the Oakland A’s, is the only Major League Baseball player whose name sounds like a chocolaty breakfast cereal. There is no truth to the rumor he may be traded for Hot Chocolate with Marshmallows.. Ever since I was this big (I don’t know if you can see me, but I’m holding up 14 fingers), I’ve been coming to the quintessential trade show for cool things, the NY Gift Show, now called NY Now. Over 35,000 people from all 50 states and 80 foreign countries attended this year’s trade-only extravaganza featuring items for the home, lifestyles and, the reason I show up, gifts. The show is so popular, it’s held twice a year, in August and January. In previous years, I’ve spent two-three days walking up and down the cavernous aisles of the Jacob Javits Center on the West side of Manhattan scurrying past 2,000 vendors I didn’t have time to talk to so I’d have enough time to check out the vendors I did want to meet.. This year I could only spend 4 hours at the show, so I had to fly past 2,800 exhibitors slow enough to notice what was hot…and what was not. 9. Custom Bobble Heads — Everyone knows someone it’s impossible to buy a gift for because “they already have Everything.” Now custom Bobble Heads are a little expensive, but they’re so unique, they’re one-of-a-kind. And what’s more, there NO CHANCE the gift receiver will re-gift it (unless he/she has a twin or triplet)! 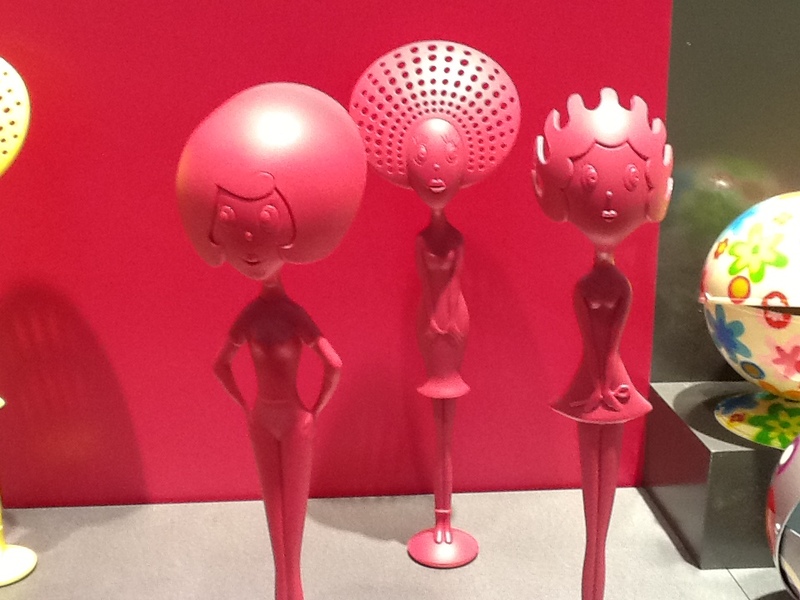 Bobble Heads have always been a little kitschy (all right, VERY kitschy). Well, custom Bobble Heads are even kitschier! You send them a couple photographs of the person you want to honor (or dishonor) and a month later you’ll have a one-of-a-kind gift for your one-of-a-kind friend. Prices start around $99.00. 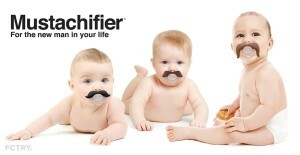 8.Mustachifier — It’s a pacifier. No, it’s a mustache. No, it’s the Mustachifier, the perfect gift for the new man in your life, as long as he’s a baby and as long as that baby has a sense of humor. Hey, look, babies cry all the time, they wet their diapers, spit up their food and they throw toys on the floor just to train you to pick them up. A baby is laughing at you all the time. Have some laughs on him and pacify at least one of his needs. 7. Rich Frog Baby, Bath and Toddler Toys — A company named Rich Frog makes adorable toys for bath, baby and toddlers. Their Lucky Duck soft toys are cute and cuddly. Duck Feet Slippers, their product for two year-olds makes those tykes suddenly less terrible when wearing the company’s signature Duck Feet Slippers. The item was so popular, they’ve introduced an adult version. The cool-named, cool looking soft plush Lucky Ducks. 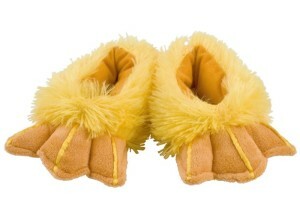 OK, they’re not for formal wear, but these Duck Feet Slippers for adults are even more fun if your kids have a pair. 6. 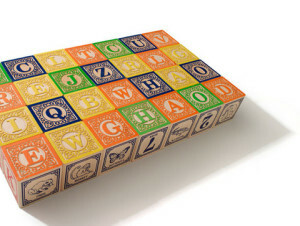 Uncle Goose Blocks — Nobody has done more for classic wooden blocks than Uncle Goose. They’ve got classic alphabet blocks, foreign launguage blocks., presidential and nursery rhyme blocks and even blocks in Braille with sign language. The designs are gorgeous and the blocks will last for many generations. 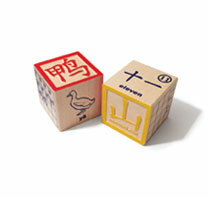 Chinese wooden blocks are beautiful and educational ($43) Other sets are as low as $24. 5. Pylones — This multi-dimensional French company mixes a strong sense of design with a splash of color, turning everyday objects into unique gifts. 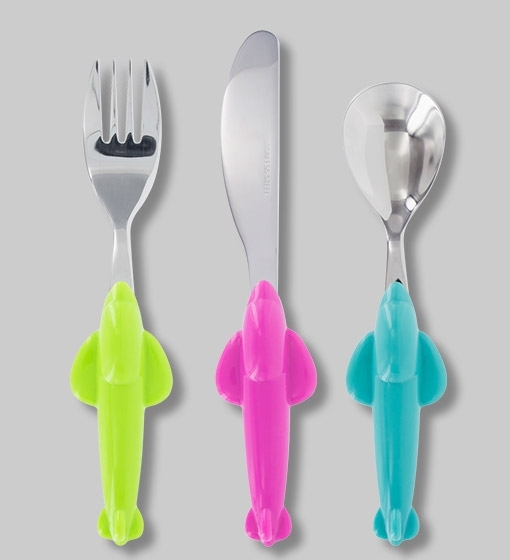 They make practically everything–pens, pencils, purses, pasta spoons, cake servers, crumb collectors, clothes brushes, even jewelry and outdoor items. Their line is very whimsical and always quite functional. 4. Mighty Purse by Handbag Butler — Fashion fuses with technology in the Mighty Purse. It’s an essential handbag accessory for women in the mobile computer age. It features a hidden, lightweight built-in battery that can recharge most smartphones including Apple, Samsung, Blackberry, LG and Android). 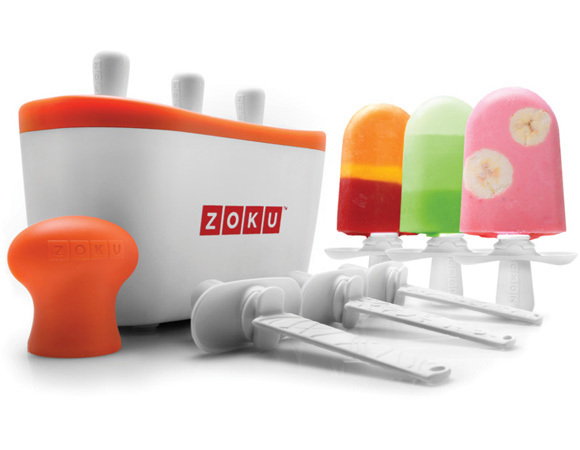 It offers a charge -on-the-go for women on-the-go. Just to be sure, make sure it’s compatible with whatever device you’re using. 3. 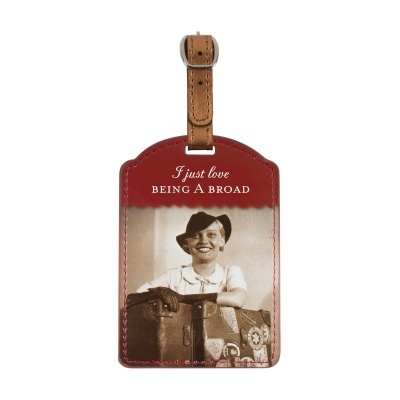 Shannon Martin, Girl Designer — Shannon Martin gives old family photos new life on a wide array of items–luggage tags, greeting cards. beverage napkins, wine tags, magnets, party plates, gift books and more. The photos are usually accompanied by a cleverly written, humorous statement. 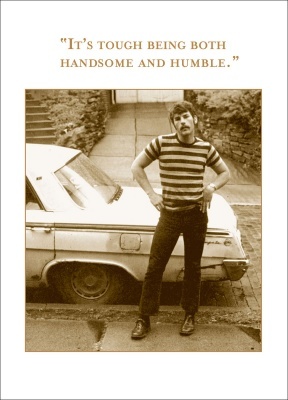 Shannon Martin’s card is perfect for someone who is handsome, but not that humble. ($2.95) Take that, Hallmark! 2. The Unemployed Philosophers Guild – The two inventive geniuses who run The Unemployed Philosopher’s Guild have cornered the market on cool and hip products. They’ve got wallets, mugs, mints, dolls, magnetic dress-up kits and much more and they all celebrate the better and lesser known celebs and historical figures like Elvis, Jesus, Davy Crockett, Darwin, Kurt Vonnegut, Andy Warhol, Jane Austen and many more. They’re great gifts for everyone, since everyone idolizes someone. 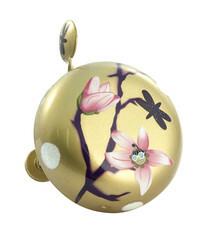 Check out their web site to see their huge selection of pop culture gifts. 1. I Heart Guts — Wins Best of Show Award! 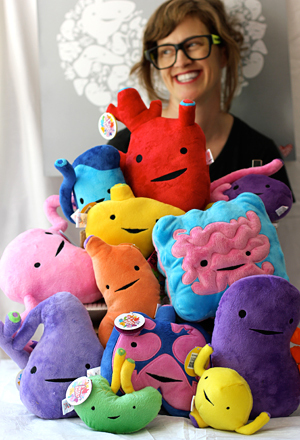 Artist and Designer Wendy Bryan used her BRAIN to make plush figures out of internal organs. They’re called I Heart Guts and they’re the perfect gift for someone with a HEART of Gold or someone who can’t STOMACH politicians. Do you know someone who has the GALLBLADDER to challenge conventional wisdom.? These unique soft plush toys deserved the #1 gift designation from 10 Minutes of Brilliance. Urine for a treat when you gift the BLADDER. You’re sure to have a ball with TESTICLE and INTESTINE is the perfect plush for someone you know who’s got guts. Steubenfield, Ohio, September 4– Two men who worked in a pottery factory in Steubenfield, Ohio, accidentally fell into the kiln. 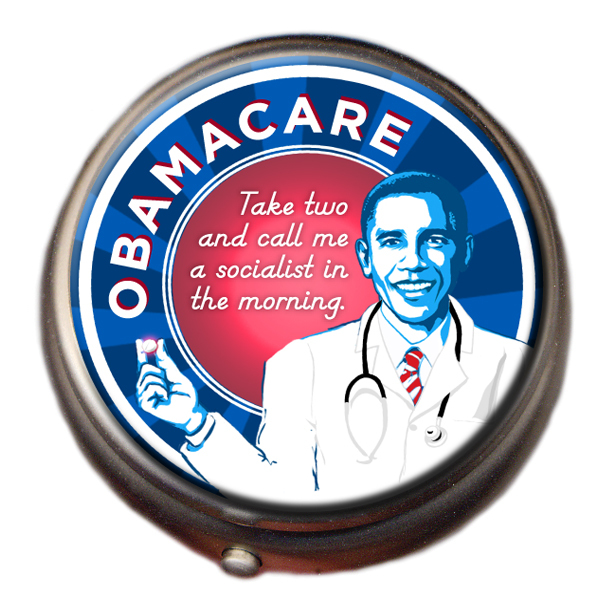 Both were promptly fired. Hey there, Readers, sorry I was late. I was at a funeral. 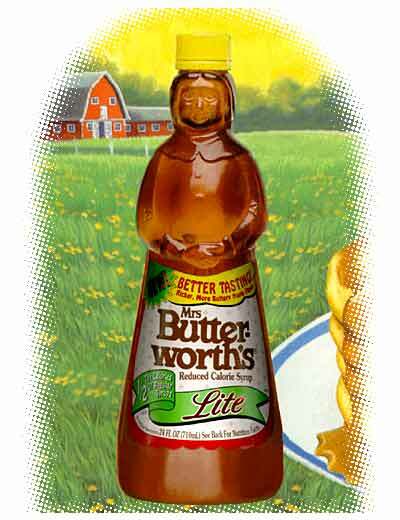 During the funeral, Mrs. Butterworth gave Pop N Fresh’s Dad, Pop Tart, a pat on the back. A pat of butter. Please join me in remembering a great American icon – the Pillsbury Dough Boy, aka Pop N. Fresh. The veteran Pillsbury spokesman would have been 50 this year. Sadly, the Pillsbury Dough Boy died yesterday from a yeast infection. Fresh was buried in a lightly greased coffin. 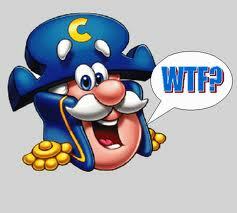 The Cap’n was not happy when only his head arrived at the funeral. The animators forgot to draw the rest of the body. 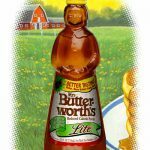 Dozens of celebrities turned out to pay their respects, including Mrs. Butterworth, Hungry Jack, the California Raisins, Betty Crocker, the Hostess Twinkies, and Captain Crunch. The grave site was piled high with flours. Longtime friend, Aunt Jemima, delivered the Dough Boy’s eulogy, describing Fresh as a man who never knew how much he was kneaded. 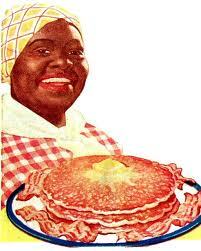 Aunt Jemima delivered the eulogy, along with some silver dollar pancakes. He was not considered a very “smart” cookie, wasting much of his well-earned dough on half-baked schemes. Despite being a little flaky at times, he was a roll model for millions. Towards the end, after his sad demise, it was thought he would rise again. But alas, he remained unleavened. Like Matzoh. He had a good temperament and very few things made him angry. Although he did get a little burnt up when someone would leave him in the oven. The Pillsbury Dough Boy is survived by his wife, Play Dough, and two children, John Dough and Jane Dough; plus one little muffin in the oven. He is also survived by his elderly father, Pop Tart. The funeral was held at 350 degrees for about twenty minutes. STAN: You didn’t write the Dough Boy’s Obituary, did you, Goldman? Never said I did. In fact, if anyone knows who originated the Pillsbury Dough Boy’s Obituary, please let me know. I will check it out and attribute it now and the NEXT time the Dough Boy dies. That’s it for today Readers. Thanks for the use of the hall. I appreciate your stopping by. Remember, do not under any circumstances leave a comment. That would only annoy STAN.